Sticks items firmly, but allows you to separate them easily. Turns papers into self-sticking notes and helps position stencils, clippings and more. Photo-safe formula is acid-free to protect important materials. Washes out of clothing for easy cleaning. 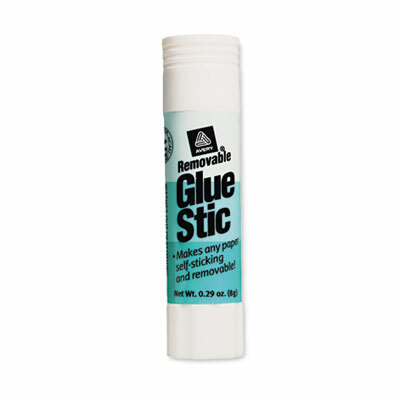 For materials that stick around only as long as you need them, this glue stic is the answer. Its removable adhesive lets you stick materials together and then separate them easily. Turn any paper into a handy self-sticking note, position stencils and clippings to keep them from sliding, and more. Glue formula is acid-free and won't harm treasured photographs and other precious materials. Wrinkle-free and clear-drying. Delivers smooth application when bonding paper to other surfaces. Easily washes out of clothing—ideal for kids.